Susy Sew and Sew: Bring on the New Year! I have been a slack blogger! Never mind I have had good reason. My sewing room has been out of action since the New Year while it has been emptied, cleaned, painted and then re-organised, re-arranged and now I have a lovely, shiny, bright sewing studio! The other wall I haven't shown is a wardrobe with mirror doors. It is better organised than it was, but still needs a little TLC. So what about 2013? I am pretty happy with most things I made. Some things have been moved on (the green hi-lo dress, but I do love the navy one). I had one top that I loved, shrink on me - a wool jersey ottobre top. I am used to merino jersey which is obviously a lot more hardy than wool jersey. It was a shame as I really liked it. Apart from that everything is still in the wardrobe and I pretty much love them all, some I wear more than others, but I couldn't pick a top 5. I have also enjoyed sewing with the Tessuti patterns and have made a few Suzy pants and one Chloe pant which have not been blogged about. These were worn before Christmas but I didn't manage any photos as it was such a hectic time. Since then we have had a heat wave and I haven't been inclined to wear pants even for a photo! I hope to still show you these as I do love the patterns, particulary the Suzy pant. Well I may not be doing a lot of clothes sewing for the next while as I had a shocker of a year last year and managed to stack some extra kilos on. I am hoping these new tops will help me with my goal of picking up my exercise plan and getting back to 'normal'. If I don't I will have to seriously start sewing to get more clothes that fit me! Ciao kittens! I wish you all the best for your 2014 sewing and look forward to sharing more of my sewing and crafting with you this year! The sewing room looks great, so bright and tidy! I've got to get back to gym as well, I slacked off at the end of last year and need to get back into it. 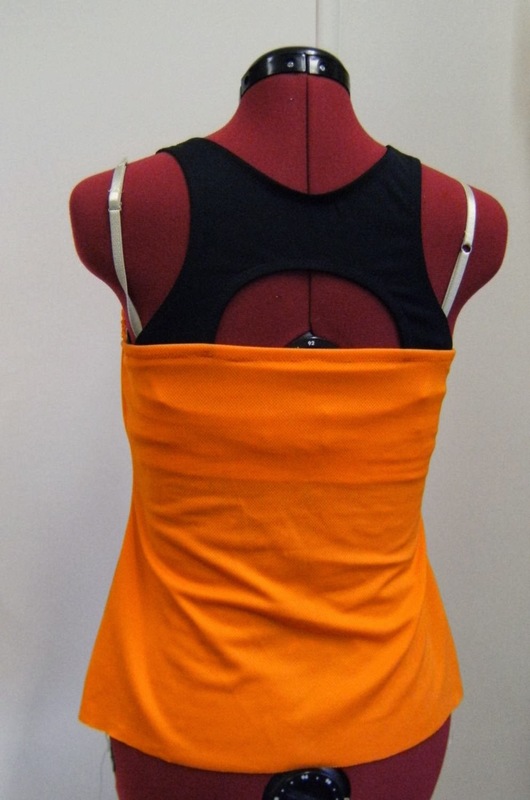 The muslin for the XYT top looks great, I really like the back detail. Can I ask where you get your Supplex from? I'd love to try this pattern as well but I am having heaps of trouble finding any decent fabric locally. They are not cheap but I am hoping that bodes well for a good quality supplex. Thanks Sue, I saw that site on her list too but was hoping I'd find some cheaper elsewhere, might just have to bite the bullet and order some, at least you don't need too much meterage to make leggings/singlets. I have heard that Metro Textiles in Sydney stocks it. I asked them for samples when I get some power mesh samples, but they didn't send them. However it may be worth a phone call if you want to check them out. Sewing room is looking good! Good luck with quickly losing those extra kilos! You have a beautiful sewing space. You're sewing room is beautiful! It looks like a wonderful place to create and I'm sure that you will make many amazing garments in it. Loving the look of the bright and airy sewing room. Very nice and a great place to create. 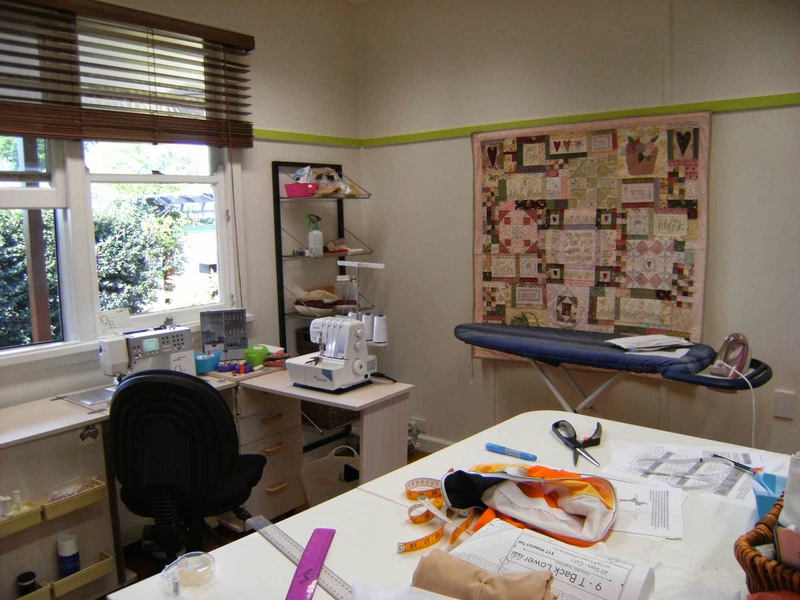 Love your bright and well organised sewing room and look forward to seeing what wonderful garments you sew this year. Happy New Year Sue. Starting the year off with a freshly painted and sorted sewing room is a wonderful way to begin 2014. 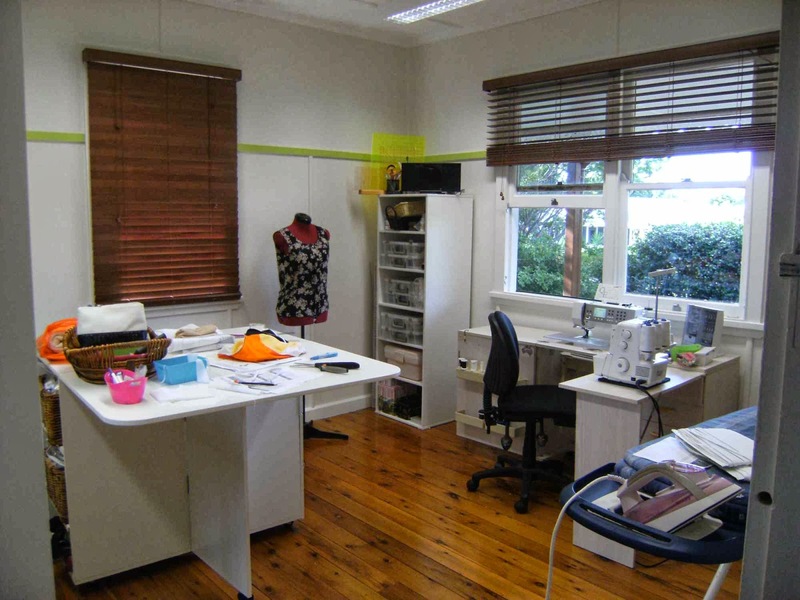 Your sewing room looks fabulous and I am qquite envious of the light and space you have in it. I will look forward to your blog about the Tessuti pants patterns too. I have been very happy with the Tessuti Lily dress pattern and made it 3 times now. It really is good for this heat wave.